If you are a new immigrant to Canada it may seem difficult to get settled in a new country, and it may seem even more difficult to secure a Canadian mortgage. Luckily, in most cases your recent arrival should not penalize you and you will still be able to borrow at competitive market rates. There are some basic guidelines and unique financing options available for people in three general situations: individuals on work visas and landed immigrants who are employed; non-landed immigrants who are employed; and new immigrants who have not yet secured a job but have applied for, or have been granted, landed immigrant status. New Canadians must be employed for a minimum of three months before they are eligible to apply for a mortgage (This excludes transfers as part of a corporate relocation program). This rule is ensures that employees have passed the standard three month probationary period with their new employer and have a higher chance of maintaining employment. Lenders will also want to see a history of credit repayment, so if you can provide an international credit report from an organization such as Equifax or Transunion, or bank references from your country of origin, you will have a much stronger mortgage application. Establishing a Canadian credit history is another important step… and applying for a credit card is a perfect start. You may want to consider a secured credit card if you’re having trouble with traditional creditors. These cards are easier to acquire and work off of a sort of prepayment method. For example, if you are approved for a $1000 limit on a secured card, you pay the creditor $1000 upfront as security, and after demonstrating that you are able to fulfill your repayment obligations, (this traditionally lasts about one year), you will get that money back. Lenders recognize that it can difficult to initially establish Canadian credit so they will consider credit history from alternative sources such as copies of utility bills that show regular payments being made (for at least twelve months) or even a letter from a previous landlord showing twelve months of on-time payments. Remember, you are only considered ‘new’ for your first three years in the country, so after those thirty-six months any extra flexibility afforded to new immigrants will disappear. Individuals on work visas and landed immigrants who are employed for a minimum of three months can qualify for up to 95% financing as long as they have a strong international credit report or can provide proof of one year worth of on-time payments of two alternative credit sources. This can include utility bills, cell phone bills, cable bills, etc. Non-landed immigrants who are employed for at least three months and can meet the same credit guidelines listed above can qualify for up to 90% financing. Despite this, individuals in this category are limited to purchase transactions (no refinancing) and to single-unit primary residences. The lender may also want to confirm that you have applied for landed status. New immigrants who have not yet acquired landed status and are not employed can borrow between 65% to 75% of the value of a property. However, this is only if they can provide a strong credit history. 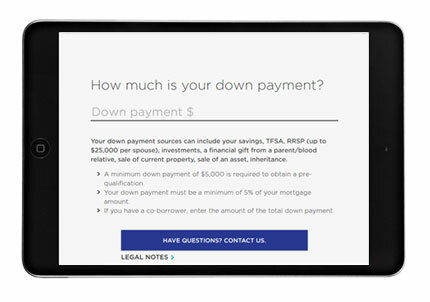 In addition to the larger down payment they will require, those needing 65% financing must also show liquid assets equal to six months of their mortgage principal, interest, and property taxes. Individuals wanting 75% financing must show additional liquid assets equal to 25% of the desired property’s purchase price. If you are new to Canada and wish to apply for a mortgage, make sure that you get in touch with an experienced professional. It is not uncommon for untrustworthy mortgage advisors to exploit new immigrants. Never place blind trust in a mortgage advisor and always make sure you have some background information on your options. It is common for new immigrants to assume that the individual assisting them has their best interest since they might be from their same country of origin, but this can be a large mistake. In many instances, these shifty advisors will secure private financing at unnecessarily high rates in order to earn a higher commissions and take advantage of extra fees. Always shop around and make sure to use an experienced professional that truly wants what is best for their customers. Your first experience with a Canadian mortgage should be a positive one!